Market rallied about 1.5% on Wednesday and then dropped 0.8% on Friday. The rally on Wednesday was a surprise to me. 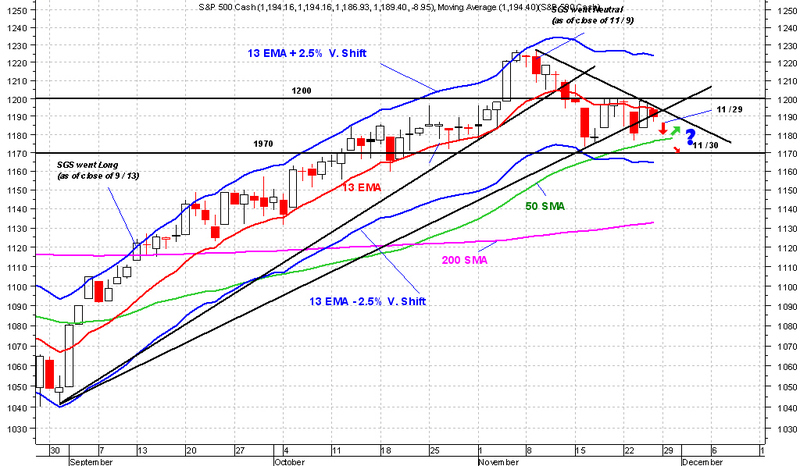 I expected either a flat to slightly up day, or a big down day to test SPX 50D SMA. Instead we got a big push up and closed just above 13D EMA and shy of SPX 1200. Then on Friday SPX gave most of the gain back and ended up again below 1190. So, what's next? Bull Case: Forget about it! Cap. Ben with his fleet of helicopters won't let up. He'll push Market up and up right into Christmas and beyond if needed. Buy every 1% or more dip and just hold. If you've done that since March 2009, you would have been up around 200%. Look for a close above 1200 if you must, then go long 40% IWM, 30% QQQQ, 20% SPY and 10% DIA. Bear Case: All rallies are just bear market rallies and opportunities to sell more shorts. 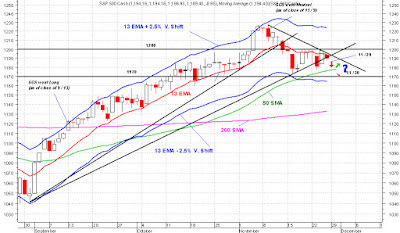 SPX is on its way to close below its 50D SMA. A solid and heavy close below SPX 50D SMA confirms a H & S Top price pattern with its objective at 1120's which would be SPX 200D SMA support. My Plan: SGS has been Neutral since close of Nov 9 which tells me that I should continue to stay in cash in my intermediate and long term accounts (IT and LT). I'm looking to see if we close solid and heavy above 1200 (which would turn SGS long again) to go long in both IT and LT. What is more probable at this point is a test of SPX 50D SMA because: (1) Both Dow and OEX have already tested their 50D SMA and (2) SPX is now the closest to its 50D SMA since it crossed and closed above it on Sep 2. A liklihood of intrady move to tag its 50D SMA is high. SPX is range bound between upper 1190's and lower 1170's. A smart plan is to stay in cash IT, LT and only continue with short term (ST) position and intraday trading. I am going to let Market make its move. A solid and heavy close above 1200 is the trigger for going long IT and LT. A solid and heavy closing below 50D SMA is the trigger for going short IT and LT. At this point, SPX very likely is going to tag its 50D SMA, rebound and continue to go higher for the rest of the year.